Pirates are never short of an excuse for why they download the latest games. The trouble is, it's getting increasingly tough to be on the industry's side. I'm not advocating illegal downloading, or even taking Grand Theft Auto 4 to its logical conclusion, ram-raiding PC World and selling a few copies down the local market for beer money, but I am getting sick of paying money to get an inferior product. Why should I have to put a useless DVD in my PC as an honesty check when the dishonest people can play at their leisure? Why should I have to type in endless serial codes, or be restricted to one PC? The dirty secret of Digital Rights Management is that it's only the first few days that particularly matters, while there's a vague chance it might slow down the pirates for a bit. After that, it's just a nuisance, and one that the games-buying public is increasingly rebelling against – to the extent that even official Amazon pages for big-name games such as Spore and Red Alert 3 have been turned into nothing but torrents of anti-DRM vitriol. No, not that kind of torrent. The industry's usual response to this kind of thing is to drop hints that the people complaining are merely frustrated pirates. With games like GTA IV on the shelves, it's not an argument that holds a lot of water. Throw in mandatory CD checks, glitchy Games For Windows (a little program that boots up on start-up just so that you won't have to click on the Start button before running the game) nonsense, missing textures and crashes with helpful messages like 'Fatal Error RMN40', and it's no wonder that gamers are increasingly running to consoles to get their wholesome hyper-violence fix. What makes the DRM war interesting is that the industry itself is increasingly split on its impact. The bigger publishers slap incredibly expensive third-party methods on games by default, even with the pirate community making it clear that it's the equivalent of using saloon doors to contain a fire. Others, such as Half-Life creators Valve, come up with their own methods. Valve's is the closest to working: it's built around online distribution, with encrypted pre-load versions that don't give you the complete game until the actual launch day. And Blizzard's World of Warcraft is arguably the only major success story, because it's essentially impossible to pirate. Yes, there are private servers out there running cracked code, but you're still getting into the game via a valid account capable of pouring money into its coffers. In that light, it doesn't make a difference if you bought or stole the disc. The real question is, does piracy actually matter? It's a difficult one to answer, and everyone will give you a different response. The two-man team behind the physics-based puzzler World of Goo (no DRM) claimed a 90 per cent piracy rate, and while the numbers behind that don't really add up, it's certainly true that many more people ripped off the game than actually bought it. Where the game's creators – along with other indie teams such as Stardock – differ from the larger industry is that they don't focus on piracy in particular. Instead, they look at a more practical question: how many people bought the game, and how does that affect the bottom line? It's not good for the industry that people pirate instead of stealing, but the oil companies don't like it that people are looking to solar power, and Burger King can't do anything about the fact that some people simply prefer to end the day with a juicy Big Mac. If you're going to be in the software business, especially in the internet age, your stuff is going to get stolen. Fact. You can't claim it comes as a surprise. A far bigger problem for the industry as a whole is that, piracy or no piracy, game development costs are getting out of control. Most don't turn a profit, and the majority of developers are working hand-to-mouth or under the Sword of Damocles. It's easy to blame piracy, because then companies can always pin their hopes on a magic bullet finally coming along. It's harder to reduce your expectations and make games that don't need everyone on Earth to buy three copies before escaping the red. Taking the sting out of piracy has nothing to do with DRM. 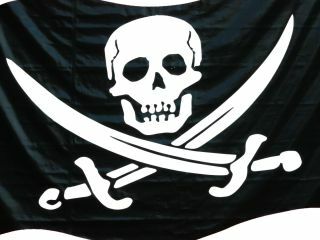 Until the industry learns to work within its means, the pirates are always going to be a scapegoat. They're definitely part of the problem, but not Public Enemy No. 1.